Not everything is a story. But ‘story’ is the trend in terms of marketing and digital in particular. In organisations, there are a few camps in the story wars. On one side we have the social scientists. In this group we have the behaviourists, the ethnographers, the anthropologists, who consider stories as a way of sense making, and of helping people create meaning (at work and beyond). The humanists. In the workplace, these are the change agents, the organisational psychologists, the culture practitioners. On the other side we have the marketers. In this group we have the branders, the advertisers, the sales pitch creators. This group understands that stories told well create desires that can be met by products. The sellers. In the workplace, this is the sales and marketing team. And then we have the creatives. Here are the people who have looked at the craft of story. The writers, illustrators, the performers. The tellers. These practitioners are not limited to one part of an organisation. A leader can be a natural at story performance. A researcher may be adept at finding the story within the data. Daniel Pink tried to bridge these worlds in his book To Sell Is Human. He equates the process of storytelling with the need to create currency for ideas and in terms ‘trade’: we all try to persuade, every day. There is such mixed practice around what stories are and how they are used that frustrations sometimes boil over, as in this slightly NSFW argument by designer Stefan Sagmeister at a conference earlier this year. Trevor Young, AKA the PR Warrior provides a pragmatic definition of organisational storytelling, the sweet spot between all the definitions in a recent post on this topic. smart organisations look to storytelling as a way to gain a competitive advantage and use stories to help differentiate their brand in the marketplace; to be successful, these stories – and the perpetuation of them in the community in which they operate – need an organisation’s employees and partners to become involved. Essentially, it becomes a cultural thing. Many communicators are caught between these worlds, and in the skirmishes. The challenge is to remember that in organisations we communicate for a purpose. Communicators have to find a path between these different forms of sense-making. They have to wear all of the ‘story’ hats and understand the difference between story sharing as culture, storytelling as motivation, and story as information. 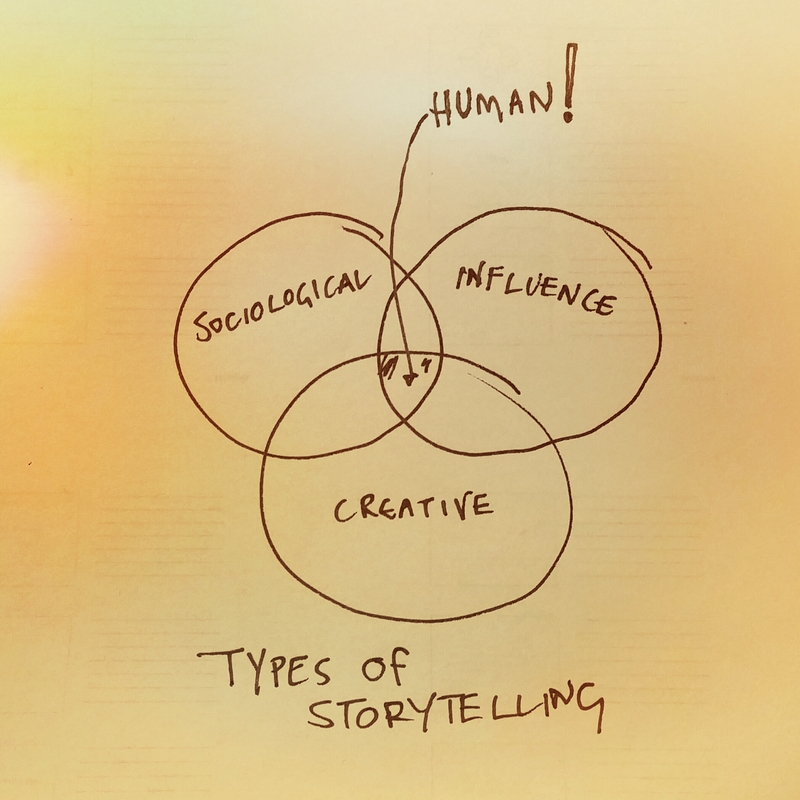 Everyone IS a storyteller, because we are human. It is impossible for us not to tell stories. But there is a difference in kind between sharing stories around the contemporary campfire – the dinner table, the water cooler, and sharing them in a public space (whether that space is real or virtual).